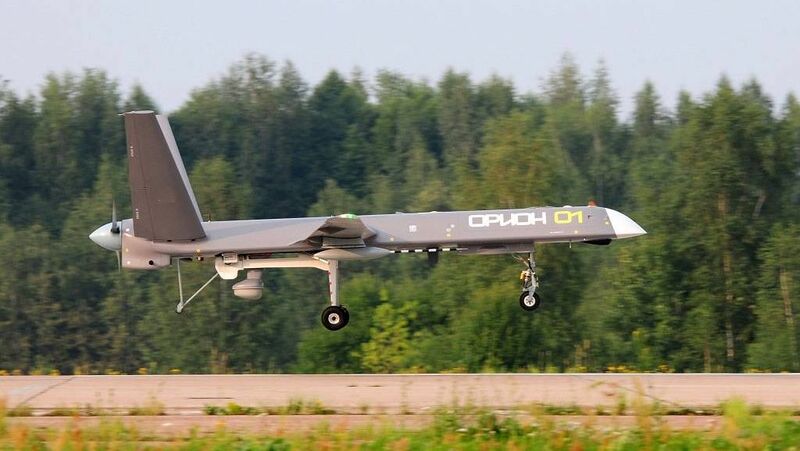 Did the Russian UAV Orion-E fired its first operational shot? In the last two decades of war, the Middle East has seen American Unmanned Aerial Vehicles (UAV) firing missiles and dropping bombs but reportedly, their Russian counterparts have also made its operational debut. According to a video, uploaded on April 4, on Agency Step News’ YouTube channel which claims the Russian UAV launched an air assault on a village north of Hama, a city in Western Syria. The aircraft in the video appears like medium altitude long endurance (MALE) UAV. Orion-E, the only MALE UAV in the Russian fleet, developed by the Kronshtadt Group, resembles the silhouette of the aircraft in the video. If true, this makes the war debut of the Orion -E.
With maximum take-off weight of 1000 kg and endurance of 24 hours, the armed drone can carry a payload of 200 kg including two 50 kg missiles to a height of over seven kilometres. It has a range of 250 km. Orion-E uses a pair of thermal and optical cameras to identify its targets and laser range finders/ target designators for target acquisition. A High Altitude Long Endurance version of the drone is under development. Since September 2015, Russian forces have been supporting the Assad regime in its fight against Islamist rebel and ISIS. This war has seen the operational debut of many of the Russian weapons including its stealth fighter Su-57.